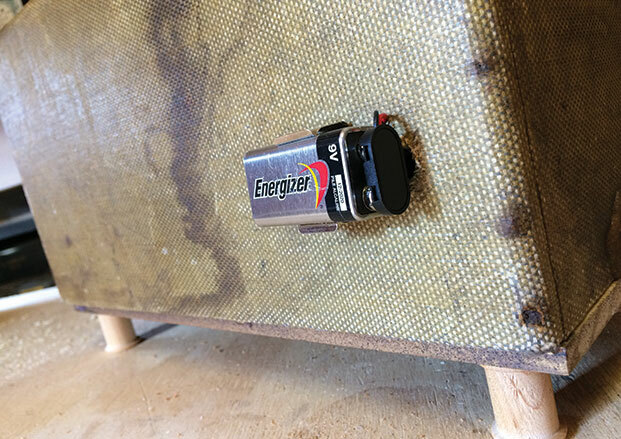 I built this great-looking (and sounding) battery-driven guitar amp in just a few hours after work last week. It’s 2.5 watts of solid-state fury, housed in the top half of a vintage Fifties film projector case. It’s loud enough for busking and for living rooms and does great in the recording studio. Let’s start with the demo video. I’m using the FrankenTulip guitar featured in a previous GuitarWorld.com column. It’s loaded with a P90 soapbar pickup in the neck position. Anyone with the most basic soldering and woodworking skills can build one of these. 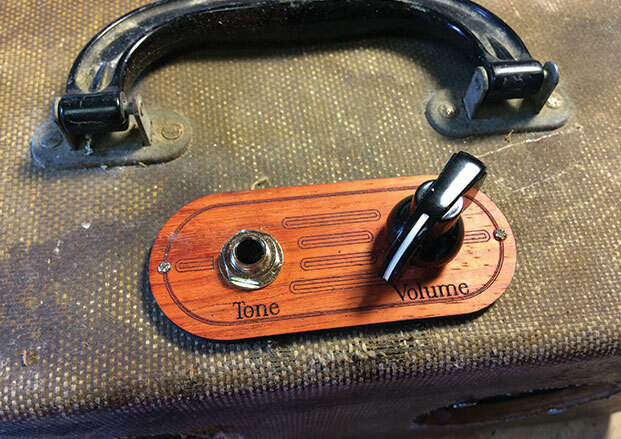 The engine behind this amp is a simple 2.5-watt cigar box amplifier kit ($38 at CBGitty.com) along with an optional second 3-inch speaker ($9, also at CBGitty.com). Note: definitely opt for the second speaker. It increases volume output significantly. We’re going to skip the cigar box for the amp housing that C. B. Gitty recommends and use a much bigger tweed case from an old projector. 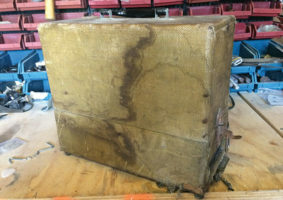 · An antique tweed-covered projector case. Old cases for 45rpm record cases work, too. 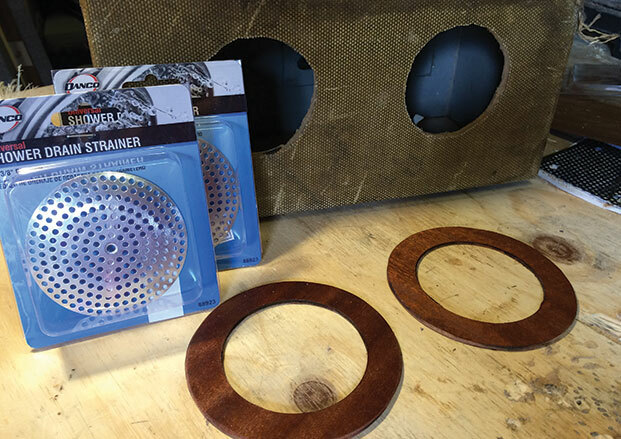 · Optional: Thin plywood to make speaker grill trim circles. 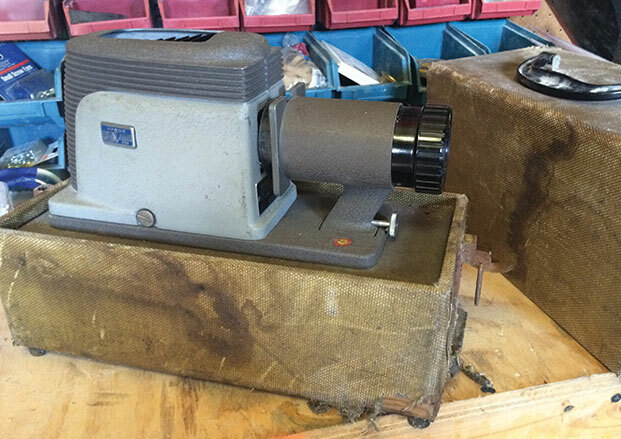 Step 1: Go junk pickin’ at flea markets or thrift stores to find an old projector case! I found this projector at a thrift store for $5. I chose it for its beat-to-hell tweed cover that had years of tears, stains and grime, giving the appearance of a 1950’s Fender tweed amp. Remove the projector from the case, saving the projector for your next Warhol/Velvet Underground-inspired show. Step 2: Prep the amplifier. Note, don’t solder the speakers yet. This is very basic kit that will only require a standard Radio Shack soldering iron, some wire cutter/strippers and some solder. The directions are idiot-proof and require only a few simple solders. 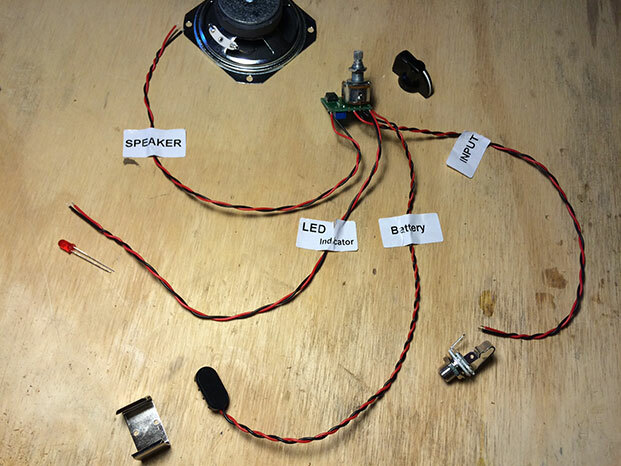 Step 3: We’re going to mod the kit slightly by wiring two speakers in parallel to the kit. This simply means we’re going to run two wires from each speaker (using the extra wire provided in the kit) and solder the black leads to the black wires of the kit and the red leads to the red wires. (I did a quick mock-up photo above.) Make sure you cover your solders with heat shrink tubing or electrical tape in order to insulate them. Viola! We just increased the output of the amp by adding an extra speaker. Step 4: Cut out the speaker holes in tweed projector case. After planning out the look of the amp, I used a compass and drew two 3” circles on the case and cut them out using a simple hand-held coping saw. 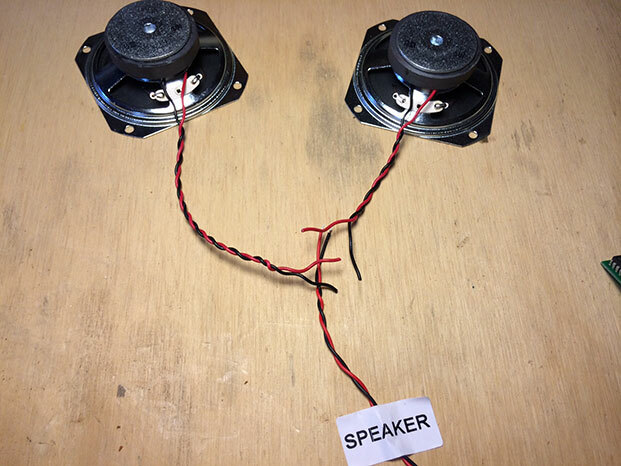 Make sure the holes are no more than 3” in diameter or the speakers won’t mount correctly. Notice that I only used the top half of the case for this project. 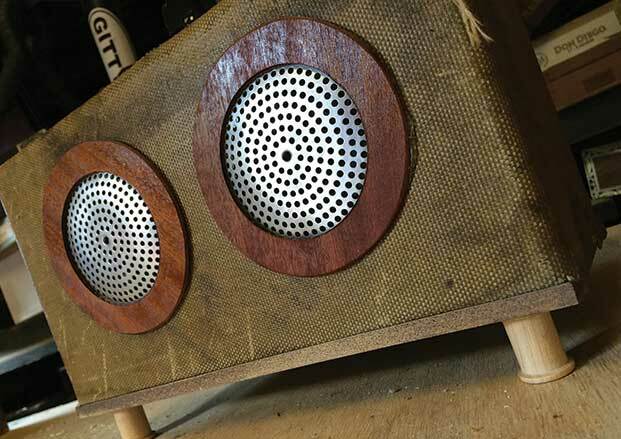 I saved the bottom half for another tweed amp project in the future. I created a new bottom for the amp by cutting a thin piece of poplar to fit. Step 5: Drill holes for speaker mounting bolts, volume knob, output jack and LED light and install everything. Note: Although the speaker covers will be top-mounted, the speakers themselves are rear-mounted. All the wiring details are covered in the kit directions. I decided to put the knobs on the top of the amp, giving it a 1950’s vintage look. I also had a cool mini-control panel in my box of junk that I repurposed for volume/output. Step 6: If you decide your tweed case will be permanently closed, make sure to mount the battery compartment on the outside of the housing. I knew I’d be gluing my amp housing shut, so I drilled a hole in the back of the amp and fed the 9v battery terminal out. I then mounted the battery clip (included) near that hole. I can now swap out batteries easily. Step 7: Install speaker covers. The amp kit comes with black wire mesh speaker covers that look great when using a cigar box as the housing and rear-mounting everything. However, we’re dealing with tweed cover cases…and the tweed rips and shreds when you cut into it. We want to cover those up by front-mounding speaker covers. I used the aforementioned Lowe’s sink drain covers and some wooden mounting circles that I cut from thin plywood. I used a hot glue gun to mount the drain covers and wooden circles. Step 8: Add wooden sewing spools as feet. Note: I lacquered the spools first, giving them a nice, finished appearance. Step 9: Get a 9v battery and crank it up. These kits have a lot of modding possibilities such as adding an output jack to drive a speaker cabinet. They’re also a lot of fun for amateur tinkerers like myself. I also recommend them to anyone who wants to teach their kids basic electronics. Oh, one more thing: Each amp circuit has a tiny gain control with a screw mounted to it. You can set your gain from pristine clean to Hound Dog Taylor dirty. If you opt for dirty gain (which I did in the video above), just remember you can always dial back the volume knob on the amp to clean things up. Next articleLower output pickups for Axis?